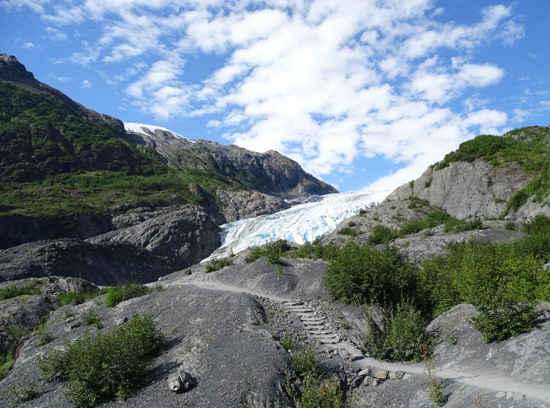 plant life reclaims the barren rocky land exposed by a glacier's retreat." This was a beautiful, sunny morning and I had to get out and make the most of it. 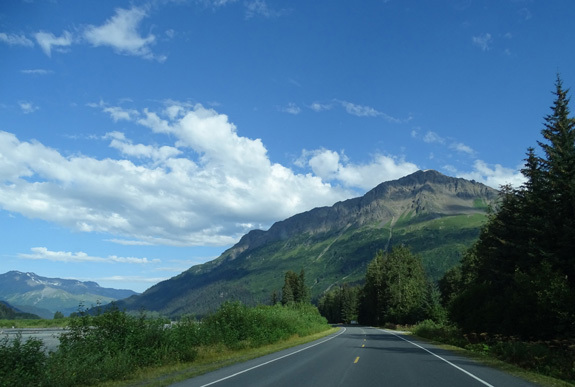 Temps ranged from 51 F. overnight at our campground in Seward to the mid-60s during the day, with some breeze and increasing clouds in the afternoon. 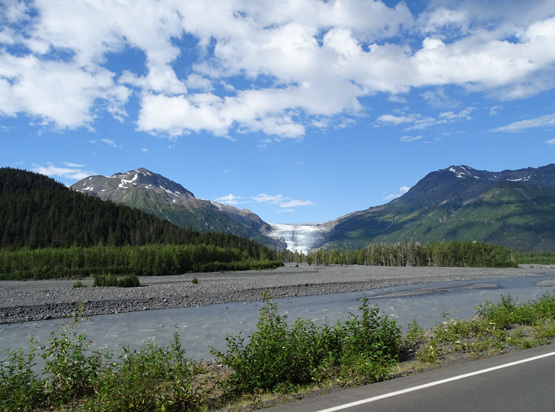 For the Kenai Peninsula, it was great weather! 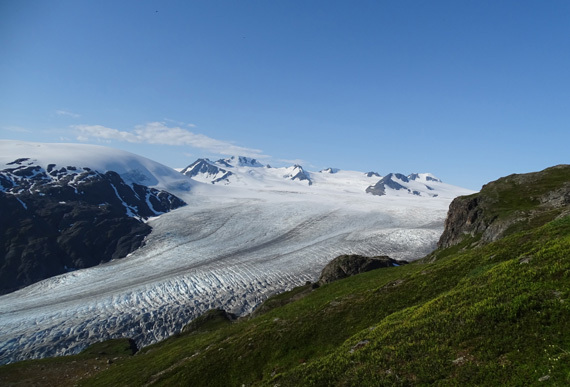 It would have been a good morning to go up to the Harding Icefield again -- so I could get those blue-sky photos that have eluded me on my two previous hikes there -- but I was too tired from yesterday's rather strenuous hike to the ice field to consider doing it all over again today. Tomorrow looks like the sunniest day of the next two that we'll be here so I plan to go up then. 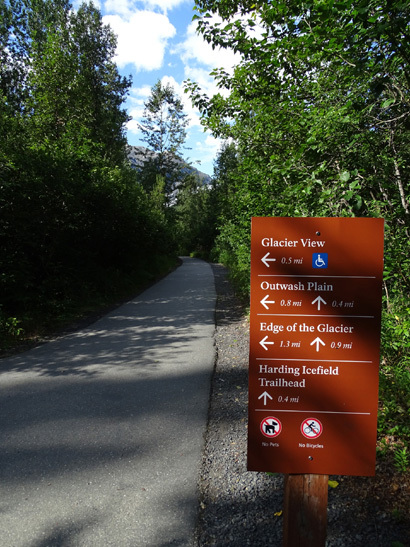 Icefield Trail on 8-7-15. 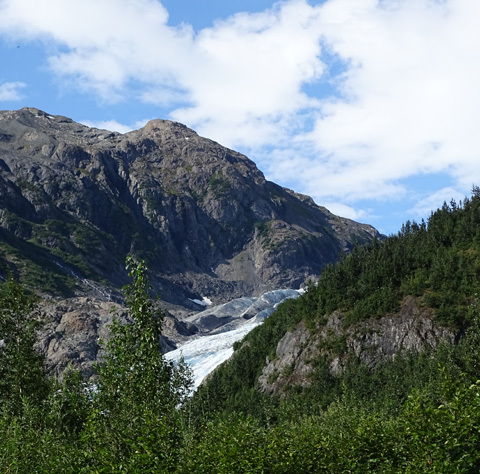 You can see most of the glacier from the valley but not the ice field. 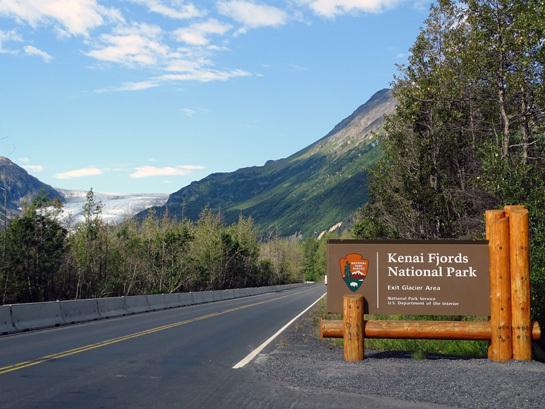 Both the trailhead to the Harding Icefield Trail and the trails that lead visitors to viewpoints of the lower parts of Exit Glacier are located in this area of Kenai Fjords NP. 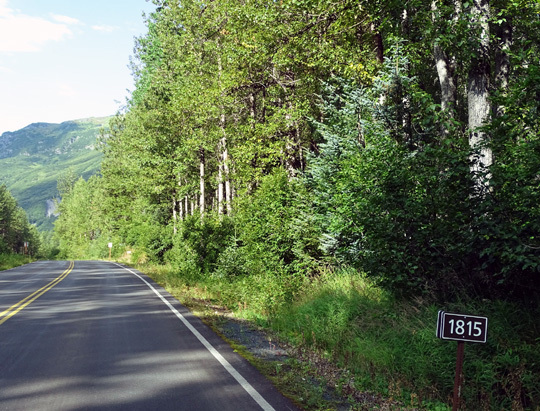 It's a 10- to 11-mile drive from Seward to the visitor/nature center. 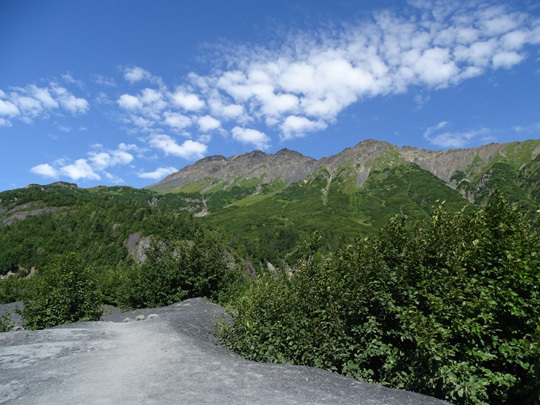 Entry into the park is free -- there's no better deal in the Seward area than this. To see anything else in this magnificent 669,983-acre park you have to take a boat or plane tour. Those are quite interesting, too, but nowhere near free. 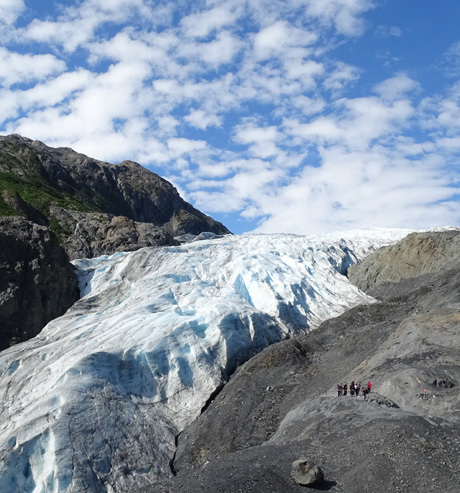 We took a memorable day cruise to Aialik Glacier, one of the park's tidal glaciers, in 2012 and it was well worth the cost. 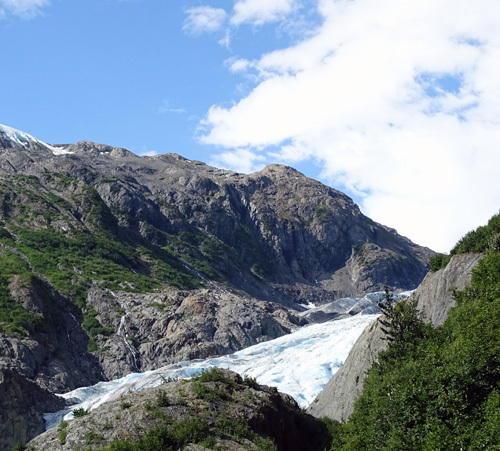 Exit Glacier is just one of about forty glaciers that start in the ice field and either hang off the edge of cliffs (like one above Exit Glacier), end in valleys (like Exit Glacier), or terminate in a bay or fjord (those are called tidal glaciers). 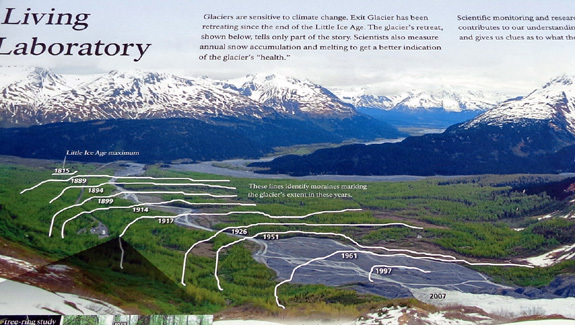 Jim and I visited Exit Glacier when we were in this area three years ago and I wrote a 2-page entry then. I won't go into quite as much detail in this one. 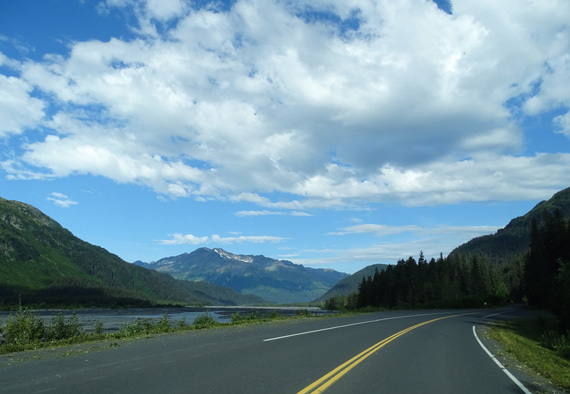 There is a wide pull-off where people like to park to fish, picnic, or stay overnight in their RVs. 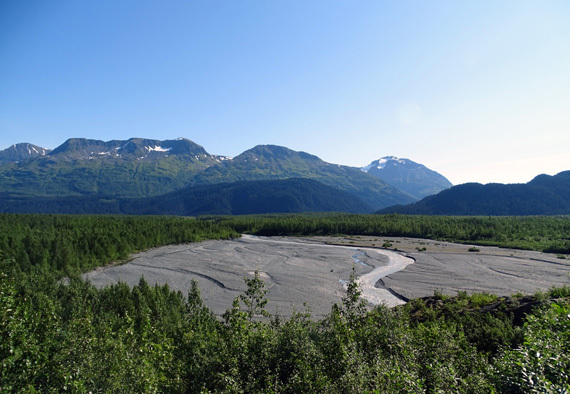 surrounding mountains flow into the Resurrection River. 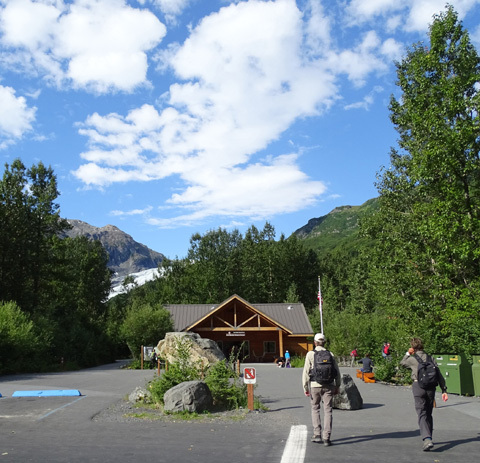 There is a good view of Exit Glacier from the entrance sign and as you approach the parking area. 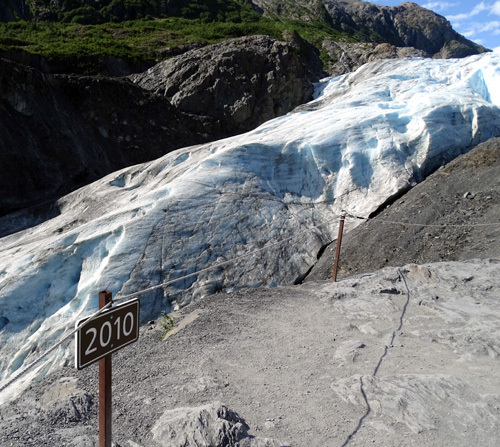 You'll see more of these date signs along the road and foot trails as you approach the glacier. 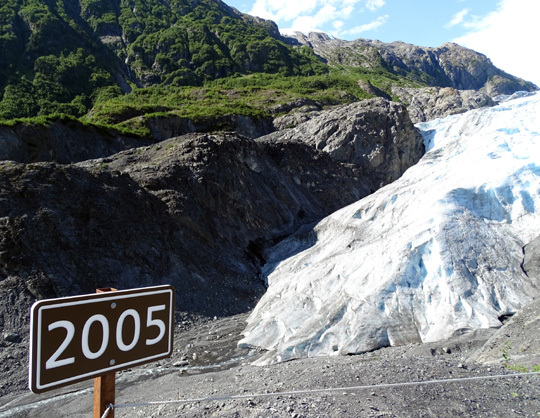 They are a graphic reminder of how much this glacier has retreated. 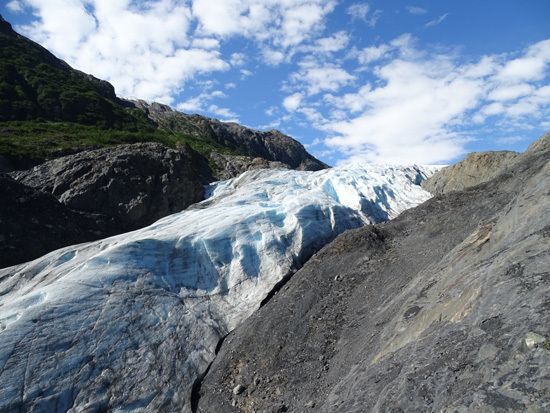 In the three years since I first walked up close to the glacier I can tell it has noticeably retreated. I'll talk more about that a little later. 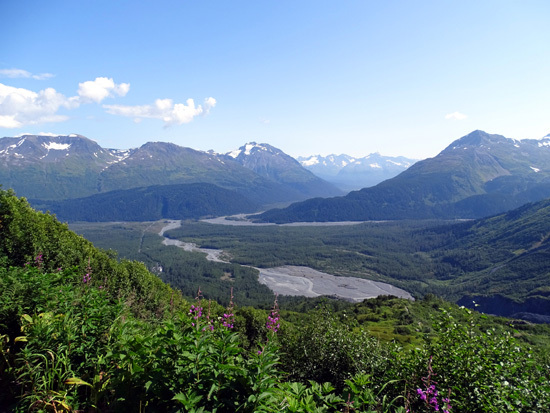 At the nature center you can get the park brochure with trail maps, look at exhibits, ask the rangers questions, sign up for ranger walks or talks, visit the Alaska Geographic Bookstore, and get your bearings before starting out on a hike. 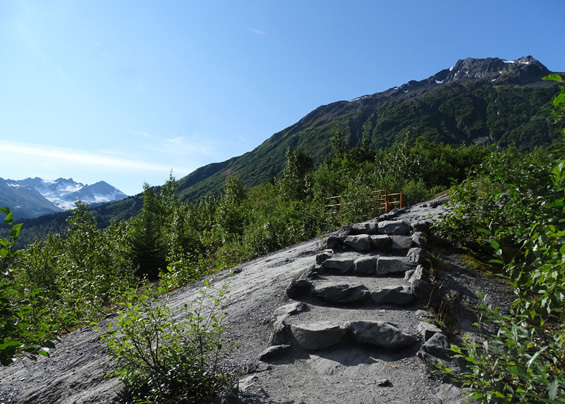 There is a nice network of trails of varying difficulty from one that is wheelchair-accessible to more gnarly, rocky trails that allow visitors to get great views of Exit Glacier. 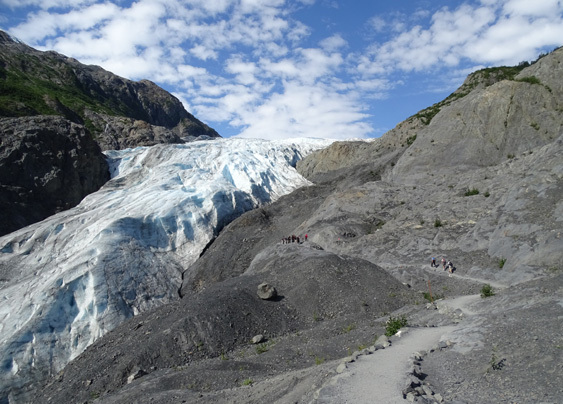 You must hike the more difficult Edge of the Glacier Trail to get up close to the ice, though. All the trails begin at the visitor/nature center. 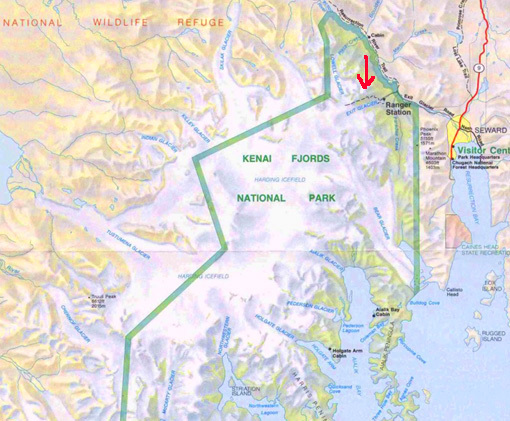 The solid yellow line indicates the one-mile Glacier View Trail that is wheelchair-accessible. It is part paved and part smooth, crushed rock. 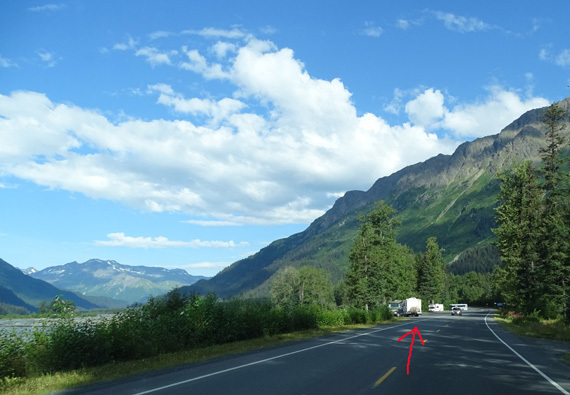 At the spot marked "Glacier View" visitors have a good view of Exit Glacier (duh!). I didn't go out that way this morning but have previously (see photos from July 6, 2012). 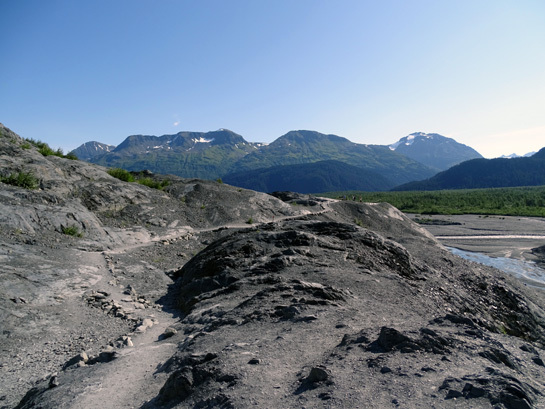 Today I followed the right side of the Glacier View loop to the trail that connects with the more rough Edge of the Glacier Trail that undulates over moraines and bedrock left exposed by the receding glacier. 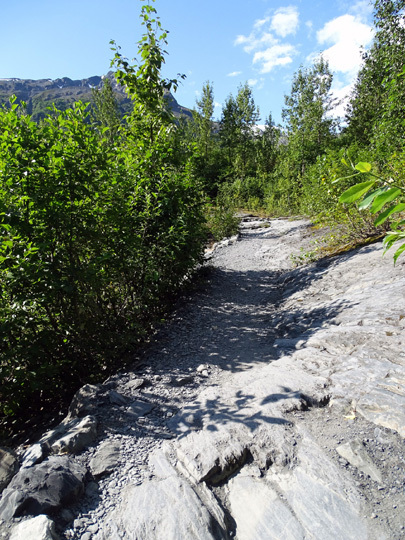 A spur trail at the end of the Glacier's Edge Trail gets you closer to the side of the glacier -- but not as close as it used to! All this bare rock used to be covered by ice. 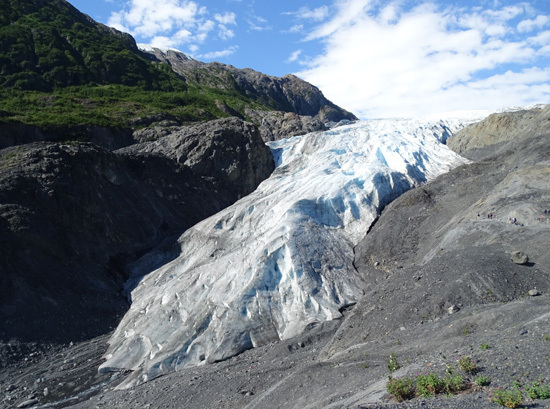 As I mentioned several days ago about Byron Glacier in Portage Valley, Exit Glacier has also noticeably retreated in the three years since we last saw it. 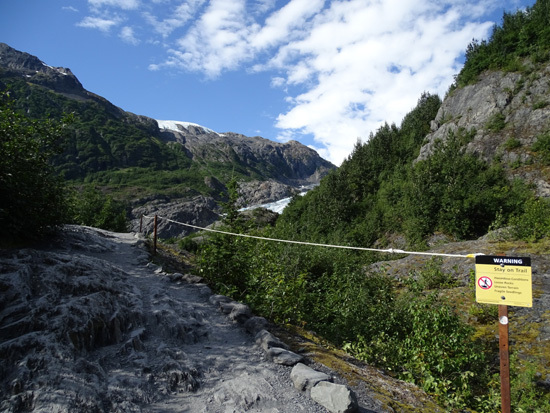 The overlook at the end of this spur trail used to get within about 10-15 feet of the ice. Now it's 45-50 feet away. 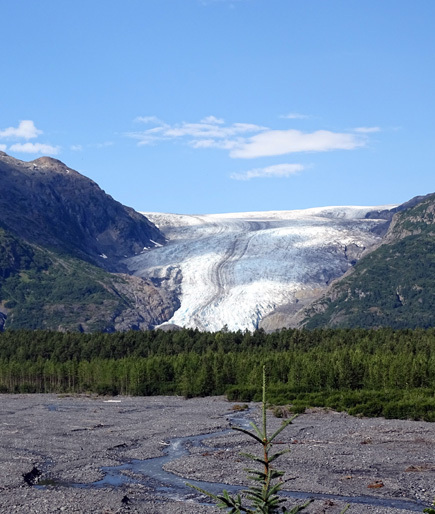 Rangers don't want you to hike down to the glacier along its length but you can walk right up to it by hiking through the gravel and little braided streams in the Outwash Plain at the toe of the glacier. 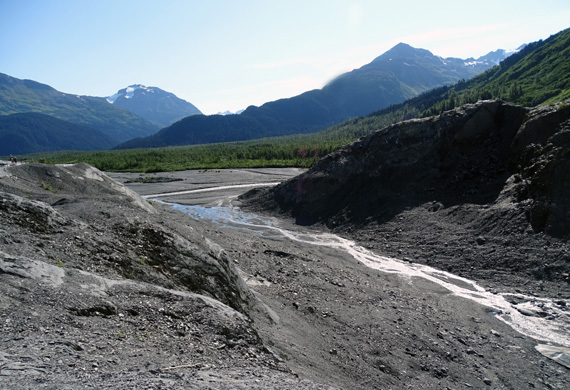 The Outwash Plain is the gravel area where the glacier has retreated but hasn't filled in yet with plants, shrubs, and trees. 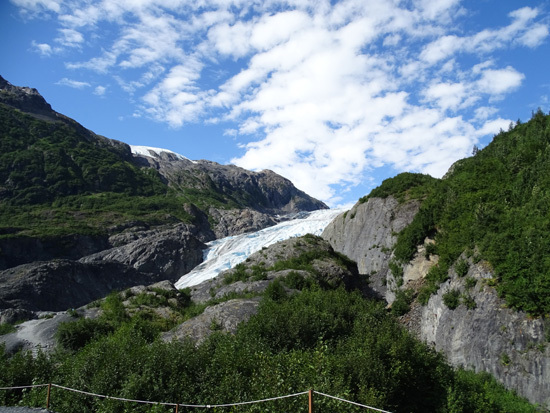 It is braided with streams of water from melting ice and snow in the glacier and from the nearby mountain slopes. 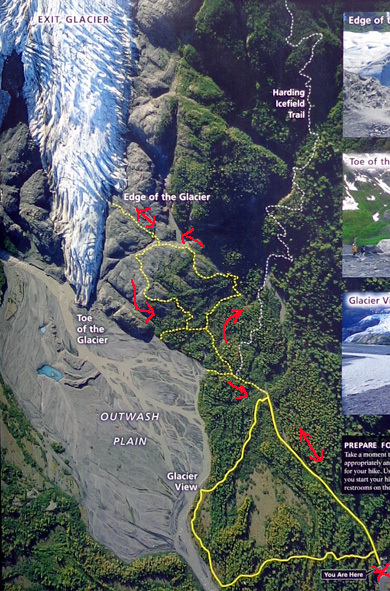 If you want more information about Exit Glacier you can refer to my entry from July 6, 2012 and/or go to the park's website link in the quote at the top of this page. 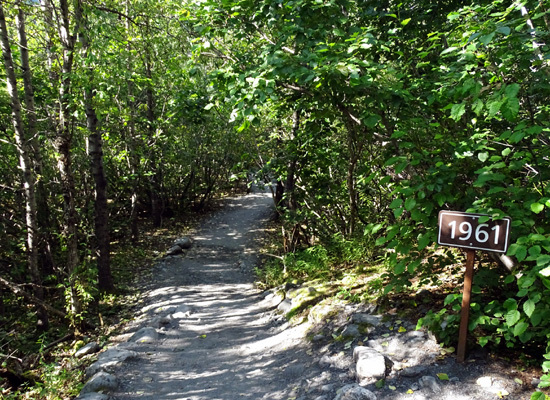 Note that this is a busy place for visitors of all ages in the summer because it is so accessible by vehicle and is located in a popular vacation area. Get there early to hike. By mid-morning on a pretty day the parking lot is often full.